On June 17, Main Street in the sleepy Toronto suburb of Newmarket was an explosion of rainbows for the annual York Region Pride Parade. The Pride parade was held in Newmarket for the first time after several years in Richmond Hill. 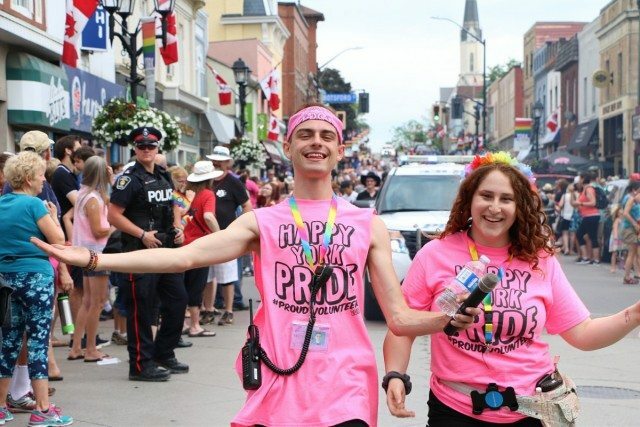 “For four years, the region’s Pride parade has taken place on Yonge Street in the heart of Richmond Hill, but this year parade organizers, feeling snubbed by the local business community, have packed up their rainbow flags and headed north to Newmarket,” YorkRegion.com reports. While a fraction of the size of Toronto Pride, small community Pride events like the parade in York Region can have a big impact. They’re often the place local queer and trans youth “come out” to family and friends, and events send a strong message that LGBTQ community members are safe, welcome, and accepted.